Preheat oven to 350° F. Insert paper liners in 12-cup muffin pan. In a large bowl sift flour thru salt. Stir to combine. In a measuring cup combine water thru vanilla. Divide batter evenly into muffin cups (1/2 to 2/3 full). Bake for 20 minutes. Cool in the pan and frost. Combine all ingredients in a bowl. Beat with electric mixer to combine. 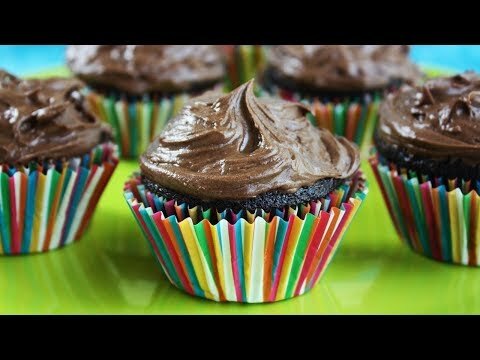 47 Comments on "Easy Healthier Chocolate Cupcakes"
Do you have the nutrition (calories / fat per cupcake etc) for these? Hi Jenny! Really looking forward to trying these cupcakes. One question…can you provide nutrition information? Just like to compare/contrast with other recipes I have made. Thanks so much! 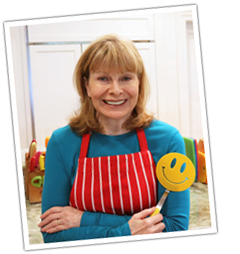 Just found your website and recipes look fabulous! These cupcakes look fabulous! I intend to make them soon. Believe it or not I’ve never baked chocolate cupcakes before! Your recipe won the Google search race lol. Took a chance and tried these – they came out perfect ! Thanks Jenny! I made these about a week ago and they were so yummy! They were ridiculously easy and SUPER moist even the day after!! Beef stew was the best I’ve ever made!!! Looking forward to making your spaghetti and meatballs next week. 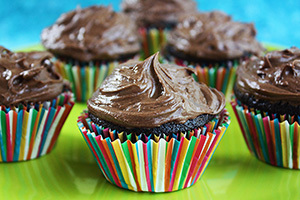 I am planning to make those chocolate cupcakes AGAIN this evening. P.S. I did sift all the dry ingredients over and over which is why I think the cupcakes were so light and fluffy! Please say what city you are in case someone has a used mixer, because these mixers are heavy and hard (expensive) to ship. This recipe does not use milk at all, only water. I suggest not changing the recipe. Healthy AND delicious? Sign me up! Hey Jenny! Lovely recipe but was just wondering if I could add chocolate chips to it? I don’t know if they would sink. You will just have to try. I was wondering if you would recommend using cake flour or if all purpose flour is better? I have used all purpose flour before and it turned out pretty good but I was wondering if you would use cake flour. I post all my recipes to be the best they can and I always use all purpose flour in my baking. I you want to use cake flour, I think you would have to use more and you can find what adjustments would be needed with an internet search on substituting cake flour for all purpose. May I take cocoa powder out if I want to make vanilla cupcakes? I tried and it did not work for me. Is it necessary to use vinegar? It IS necessary to use either vinegar or fresh lemon juice. Hi Jenny – does it make a difference if you use apple cider/white vinegar in place of distilled white vinegar? I have only made it with fresh lemon juice and with distilled white vinegar but I know other recipes use cider vinegar and white vinegar. The most popular recipes are: 1) Fall-Off-The-Bone Ribs 2) Cinnamon Rolls 3) Simple Whole Wheat Bread. The ones I make the most are 1) Granola Bars 2) Tortillas 3) Giant Breakfast Cookies. Sorry, I do not have a different frosting. Yes, in fact you can put any frosting on a chocolate cupcake. Can i use any oil to bake these cupcakes. It could be that the oven was not hot enough. Assuming you did not make any changes in the recipe, next time make sure you take enough time to preheat your oven. Mine takes about 20 minutes. Every oven is different so it’s helpful to use an oven thermometer because even if you preheat it for a long time, it could be your oven is lower than your setting. Hi Jenny, do I really require to use 1 cup of sugar? can I cut it down? May I ask why you use vinegar in this recipe? Does it make a difference if I skip it? Skipping the vinegar will make a big difference. Vinegar is an acid and is often included in eggless cakes and cupcakes to react with baking soda and start the chemical reaction needed to produce carbon dioxide and give those baked goods a lift as they bake. Thanks for your quick and helpful reply. May I replace the vinegar with something acid else, like lemon juice? My daughter & I made these for my husband’s bday. They were a huge hit. Thank you for this easy, healthy, delicious recipe. So much better than a box mix! Hello Jenny. I have a question. Do you need to keep finished cupcakes refrigerated? I want to take them to work and I’m wondering whether they will be ok in a room temperature for the 6 hours or so? Thanks again for all your recipes. I love them. I always refrigerate frosting that contains cream cheese or sour cream but I would have no problem leaving the cupcakes out for six hours. My thinking is that milk or sour cream would never spoil if left out for 6 hours or even a little longer.